To beacon or not to beacon: a question on the lips of many a baffled retailer. The proximity-based technology has been the promise of a revolution, a central character lining the pages of many a retail-focused tale for the past few years: but wherefore art thou retailing Romeo? Despite the headlines, there seems to have been a distinct lack of energy behind the tech - only rumblings of progress have rippled through the market - with retailers such as Tesco, Target, and Asda launching tentative trials in the past couple of years. But given that 84% of shoppers are using their smartphone in-store, the opportunity to create a more complete, 360 degree single customer view is dazzling, no? Beyond the supermarket aisles, London’s very own (self-dubbed) ‘Mile of Style’ became the first shopping street in Europe to pioneer the technology back in 2014, delivering “exclusive personalised content to shoppers” with an app specially designed to turn distractive smartphones into sales tools. 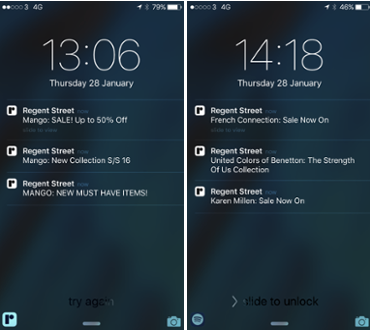 Part of a £1 billion modernisation programme, the Regent Street app’s ongoing beacon project has successfully reached over 120 retailers: however has it reached the all important hearts and minds of shoppers? In the name of all things good and true we donned our trench coat, dusted off our deerstalker and hit the well-trodden paving slabs of Regent Street to investigate the success of the tool and its ability to drive street traffic, in-store - as well as the current state of beacon tech in retail. Has beacon tech met the same ill-fated conclusion as the QR code? We investigate. What exactly is beacon technology? Firstly, what even is this bea-con thingy, and what are its applications for retail? Beacon technology is a low-cost, micro-location-based technology which uses Bluetooth Low Energy for communicating with beacon enabled devices. The tech gained traction in 2013 when Apple introduced the iBeacon to the market. 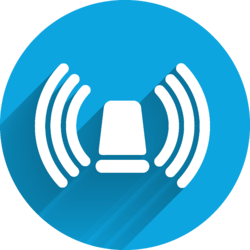 Various vendors have since made iBeacon-compatible hardware transmitters - typically called beacons - that broadcast their identifier to nearby portable electronic devices. In retail, the technology is being used to deliver hyper-contextual, highly-targeted and personalised content to shoppers based on their location. The growing focus on multichannel marketing in the retail industry is cited as one of the major trends driving the growth of the beacon market, which will influence a whopping $44 billion worth of US retail sales this year, according to a Business Insider report. Helping build a single profile where all the touch points with an individual customer can be recorded, analysed and leveraged for more personalised marketing. Keeping track of loyal customers and rewarding accordingly. Providing contextually relevant functionality specific to location: retailers can leverage beacons to offer suggestions to “complete the look”. Customers to reach out to sales associates from within an app: retailers can incorporate device-to-device BLE services. Combination of online and offline shopping: features such as “reserve-in-store” and “click to collect”. Contactless payments: beacons can be used in-store to allow shoppers to buy a product in real-time. A recent study published by inMarket found that beacons deliver a 19x increase in interactions with advertised products, a 16.5x increase in app usage in-store, and a 6.4x increase in app retention - impressive stats. In the age of context, beacons can provide the information you need when it's needed. So, is the technology more than just a pipedream? 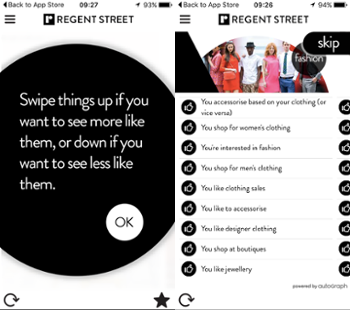 The Regent Street app is unique for its one-app-one-street proposition and its ability to bring together brands of differing distinction, marketing identity and target demographic into a single app. Brands including Burberry, Banana Republic, All Saints and Zara all live side-by-side under one roof. The project is a unique partnership between the Crown Estate (nominal owners of the street), Ogilvy Labs, and Seattle-based digital agency autoGraph (who developed the app). 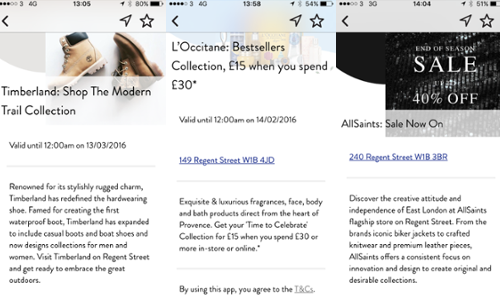 The mobile app, available to download from the App Store and Google Play, uses Beacon devices which are placed in stores to push personalised messages and offers to consumers' smartphones whilst they stroll down the street and shop. 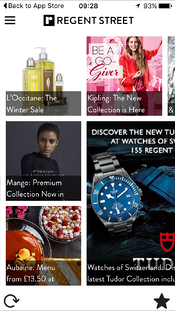 The app aims to bring “together online, physical and mobile retailing” by creating “an experience which delivers across all of the platforms that appeal to 21st century shoppers,” said head of The Crown Estate’s Regent Street Portfolio, David Shaw in a statement to mark the release of the app. So, does it work? Firstly, the app asks for permission to use your location data and then begins to glean your shopping preferences. Interestingly, the app – unlike others – doesn’t ask any demographic questions. The user experience is clean, stylish and intuitive (akin to Tinder’s interface). It took less than a minute to establish preferences and get going. Secondly, the app gives you a chance to refine your preference set by making a guess at what categories you like - letting you ditch the unwanted suggestions - leaving you with a highly pesonalised list of options. Based on preference information, it then prepares a personal wall of brands which can be accessed when you’re away from Regent Street to help plan your next visit - a great way to encourage activity beyond the shopping street. With our preferences aligned, we hit the paving slabs of the street (waving your phone in front of shops is not necessary FYI, trust us). An incessant buzz rippled across our screens, with the app delivering a host of messages at location-specific intervals as we passed by our preferred shops. We got an onslaught of messaging from Mango and a range of "sale now on" messages from the rest. So, the technology obviously works. However, we were often targeted by stores a while after crossing beyond their threshold. Those that did deliver pings: nothing went beyond the simple "sale now on" and none were time-specific - more a regurgitation of brand bios. L'Occitane was the only shop to deliver a more enticing offer, however, on closer inspection: this offer was clearly advertised in their shop window and wasn't exclusive to the app - a missed opportunity? Some brands didn’t send me any pings at all - despite our preference set - we won't name and shame. Furthermore, after speaking to retail assistants along the shopping street, few knew about the proximity marketing tool and only one (out of 10) knew there was an app - underlining a lack of street-wide unity behind the technology and its amazing potential to target shoppers and bring offline together with online. Elle magazine launched a stateside programme called Shop Now in a bid to get its readers into physical stores using beacon tech. The fashion glossy made its editors’ product picks more shoppable to the 25 million combined users of shopping apps, ShopAdvisors and RetailMeNot. 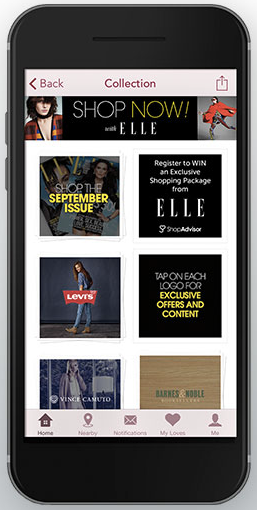 Users who opted in to receive push notifications were sent alerts if they were within a mile of Levi’s, Vince Camuto, Barnes & Noble or Guess stores - highlighting that Elle’s suggested picks were within reach. If the customer opened the message and visited the store, the technology, powered by Swirl, pushed another notification twinned with a promotion to encourage a sale. Within five weeks of the tech programme, the push open rate was 15 times higher than the mobile advertising average of 0.8, while in-store visit rates were 100 times higher, according to Swirl and ShopAdvisor. An increase of roughly 500,000 store visits. The programme, which will be continued this year, was designed to increase engagement with Elle's online face - tapping into the growth of mobile shopping and asserting the magazine as an essential rag for bargain-hunting fashionistas. 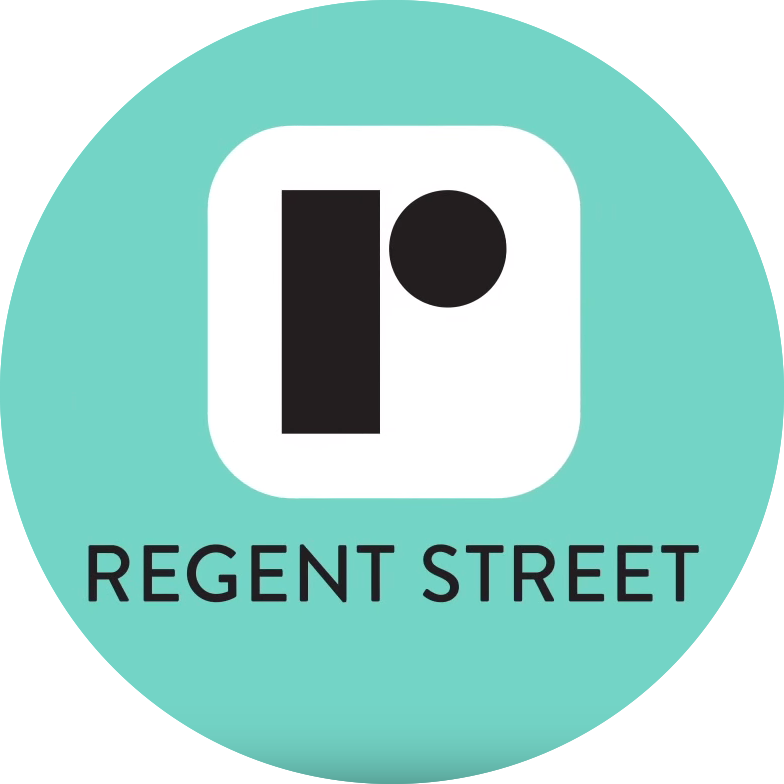 The Regent Street App is great, in theory: a) the technology works b) its user experience really is quite fantastic and c) shops have beacons ready and waiting. However, the app did little to drive engagement beyond the generic promotional message, a disappointment considering the bewildering potential of the app as a tool to bridge the online-offline divide and deliver personalised location-based messaging in the age of relevance. The app itself is great - The Crown Estate and its partners aced the customer experience – it's clear that a more unified effort is needed to take the tool more seriously, to use beacon technology as part of a dynamic marketing strategy. But the potential is there and we for one are looking forward to seeing how the project evolves, and how visitors and retailers interact with beacon tech, as proximity marketing slowly gains traction in retail.